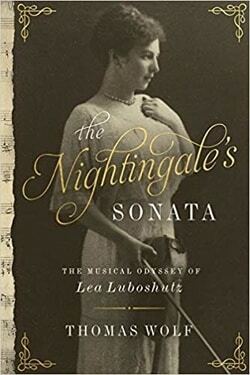 Spanning generations, from the shores of the Black Sea to the glittering concert halls of New York, The Nightingale’s Sonata is a richly woven tapestry centered around violin virtuoso Lea Luboshutz. Like many poor Jews, music offered an escape from the prejudices that dominated society in the last years of the Russian Empire. But Lea’s dramatic rise as an artist was further accentuated by her scandalous relationship with the revolutionary Onissim Goldovsky. As the world around them descends in to chaos, between revolution and war, we follow Lea and her family from Russia to Europe and eventually, America. We cross paths with Pablo Casals, Isadora Duncan, Emile Zola and even Leo Tolstoy. The little girl from Odessa will eventually end up as one of the founding faculty of the prestigious Curtis Institute of Music, but along the way she will lose her true love, her father, and watch a son die young. The Iron Curtain would rise, but through it all, she plays on. Woven throughout this luminous odyssey is the story is César Franck’s “Sonata for Violin and Piano,” a work championed by Lea, one of the first-ever internationally recognized female violinists. It became a touchstone for her, for her multi-generational family of musicians, and for scores of her students who played this masterwork throughout the world.